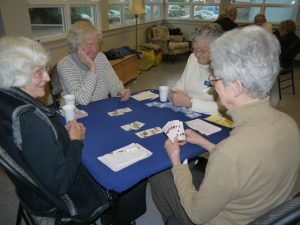 This active drop-in bridge group meets every Wednesday from 1:00 to 4:00 pm., in the Big Room. New members are always welcome. As we are a playing group, we would ask that members have a basic understanding of bidding and play of the hand. This group will continue meeting through July and August from 1:00 – 3:00 pm. Please contact Orma Paton at 250-658-4805 for further information.